For our Valentine’s Day Single Awareness Day special, we bring on Geoffrey Tebbetts to discuss his contributing blog, Golden Ani. The blog is dedicated to the past 50 years of Japanese Animation, with written reviews by other anime bloggers/big kahunas out there. After a few questions to that, we get to our main topic, our “anime first loves,” where we talk about what anime’s we first fell in love with that really got us into anime. 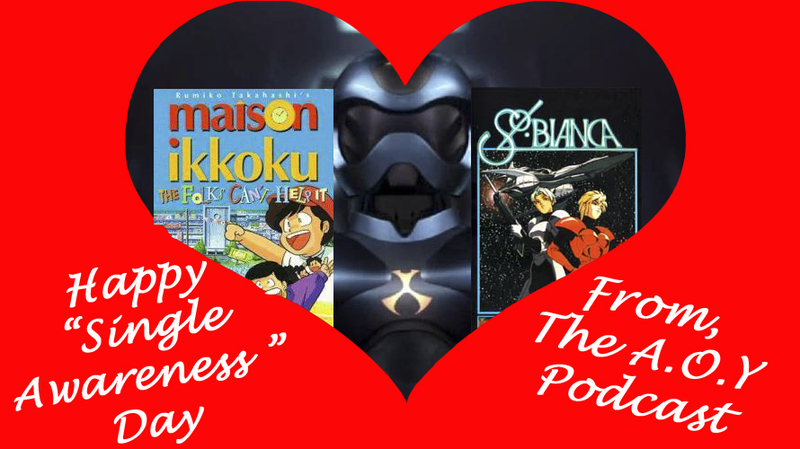 Geoffrey talks about Maison Ikkoku, my co-host Jonn and Josh talk about the glory days of Toonami programming shows that made them anime fans, and I bring up my personal favorite OVA “first love,” Sol Bianca. Oh, and me and Jonn talk about an “en espanol” station, Locomotion. Do you believe in Ani-LOVE!!! Do you believe it’s true? How I first saw Akira before I saw Akira. Thank you Locomotion for showing me this… I seriously thought I would never see this again. This entry was posted on 02/14/2013 by zeonicfreak. It was filed under Anime, Guests, Reviews and was tagged with Dragonball Z, Geoffrey Tobbetts, Golden Ani, Hamtaro, Locomotion, Maison Ikkoku, Sol Bianca, Toonami.